As I was driving through snowy northern Montana (this was this past weekend) on my way to Glacier National Park, I ran across a coffee place that really caught my eye. 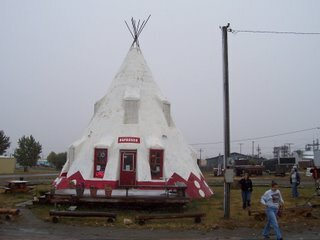 It was one of those coffee places you drive up to and you know the coffee will be mediocre, but the sheer fact that this one had a teepee for a building reassured me that it was worth the try. To put it simply, the place was not on the top ten of most amazing places I've been to but it was at least good. I didn't catch any information (as I was in a hurry) but I did notice that the barista/owner was very skilled. My americano was pretty good and the long line of people seemed to confirm the place was at least a bit decent.